Leaves, seeds, fruits, small lizards, bird eggs, small mammals and carrion. 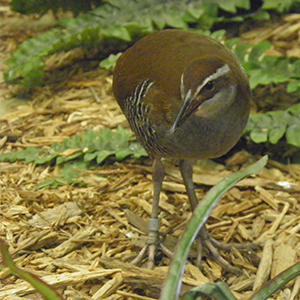 Guam rails can only fly about 3 to 10 feet at a time. They are extinct in the wild. Rails are characteristically omnivorous which allows them to take advantage of available food sources. Other species of rail are seeing a continuous population decline due to habitat loss.